This is one of those OMG! desserts. You can’t believe how good it is. A graham cracker crust, with chocolate fudge which is basically the fudgey part of the dairy queen cakes (double score on figuring that out), toasted marshmallow ice cream, and then brûlléed marshmallows on top. The secret ingredient that gives it that campfire taste is the smoked sea salt. It takes this dessert to another level. This is a night before dish. It needs to set in the freezer, so it’s best to make it in advance and do the finishing touches when you’re ready to serve. You will need a torch for this. Since it’s ice cream, you really can’t put it in the oven on broil. You can find the mini torches at any kitchen store. Sometime they come in creme brûllée kits with ramekins. Line the bottom of a square glass dish pan with parchment paper. Have extra parchment paper going over the sides. It will make it easier to remove. Spray the paper and the sides of the dish with cooking spray. In the bowl, combine the graham cracker crumbs and sugar. Mix together and add the melted butter. Mix well until it looks like sand. Spread the mixture into the bottom of the prepared dish, pressing gently to form an even layer. Place the dish on a baking sheet and bake for 15 minutes until the crust is golden. You can buy the ice cream. It usually comes in 500ml containers and you will need 2. Or you can make the ice cream and have leftovers. Warm in cream on low heat in a small saucepan. Once the cream is warm, add the chocolate chips. Stir gently until the chocolate has melted and the mixture is smooth, about 3 minutes. Stir in the espresso powder and vanilla. Make the graham cracker crumb crust as per the instructions above. Take out of the oven and let cool. Meanwhile, make the chocolate ganache as per the instructions above. Pour onto the gram cracker crust, making it an even layer. Sprinkle with smoked sea salt. Put in the freezer to set for 10 minutes. Remove dish from freezer, pour the ice cream into the dish and spread evenly. If using store bought ice cream, let it soften so it’s spreadable. If using my recipe, pour what you need into the dish and freeze the rest for another time. Cover with tin foil and put back in the freezer overnight. Place 10 large marshmallows on a line baking sheet. Bake for 10 minutes until the have doubled in size and are slightly golden. Cut ice cream bars into squares. 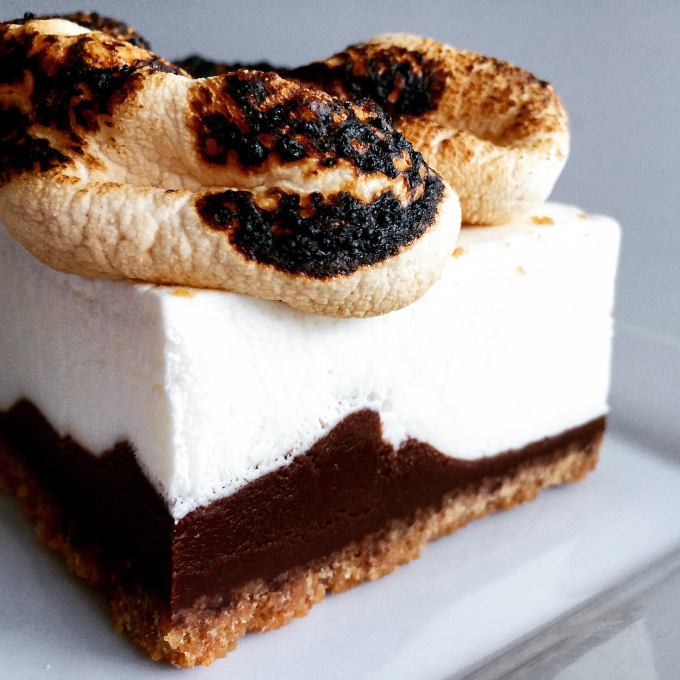 Top with two marshmallows and brûllée. Sprinkle a little smoked salt on top for finishing. If you have left overs you can put them in a freezer container. Do not brûllée the marshmallows in advance. When you want to have them take the bars out of the freezer and let them sit on the counter for about 5 minutes, then make some more marshmallows for the top and brûllée and serve. The smoked sea salt is optional, and if you can’t find it, sea salt on the chocolate will work. I buy the PC brand which I like. I also loved marshmallows when they are gooey. I would be the one patiently roasting my marshmallow by the campfire so the whole marshmallow was gooey. So I wanted the same thing for this dish. But if you can’t be bothered baking the marshmallows them just brûllée them. This is one of the best desserts I have ever tried: decadent, fun, different… adults and children alike would LOVE!